Most Malaysians don't know Othman Wok. Well, not to worry my fellow Malaysians because, frankly, not many Singaporeans know who Othman Wok is, either. The children of three-time ISA detainee A. Samad Ismail know Encik Othman better than I do and they are shocked by Pakcik Othman's unprovoked atack on their late father as he attempts to immortalize his Lee Kuan Yew, his beloved late boss, and paints himself as someone with more substance than he actually has. Please read Nuraina's Samad Ismal: Of friends and foes. For reasons, perhaps known only to Othman who considers my father "a good friend", he chose to repeat and publish a false allegation made decades ago against my late father - that he was a "card-carrying member" of the Malayan Communist Party. A charge my father had denied following his release in 1981 after four-and-half years in detention under the ISA. I write, on behalf of my sisters and brothers, to say that - with due respect to Othman, we find the reference made of our father despicable and a deliberate act to malign his name. We will not be drawn into further remarks to set the record straight and to clear our father's name for obvious reasons. Individiuals (from both sides of the causeway) responsible for the detention of our father are all dead and gone. There are lot of materials on Pak Samad. 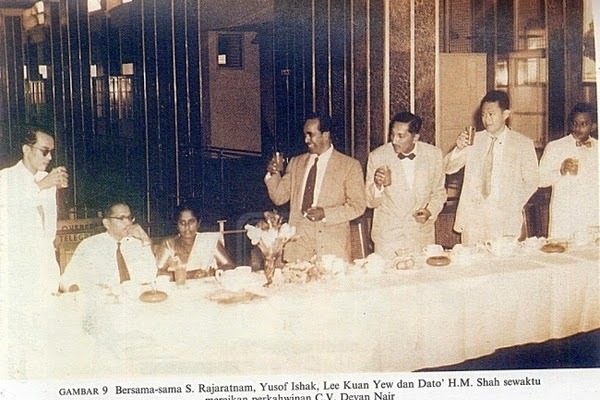 Briefly, he co-founded PAP with Lee Kuan Yew but quickly became persona non grata because, well, he was simply too influential, especially among the trade unionists and the non-Malays, and that was the kind of competition that Lee Kuan Yew did not need. Malaysia's second PM, Tun Razak, sought Pak Samad's counsel regularly after Samad settiled down in Malaysia but as soon as Razak died, the keris and daggers came out of the sarongs of Umno people who felt that he was a threat to them. He was detained under the ISA throughout the tenure of Hussein Onn's premiership, released only after Dr Mahathir Mahathir became Prime Minister in 1981. If you do have comments to leave, please leave them at Jalan Sudin h e r e.